I've recently co-authored an article on the NVIDIA Parallel Forall website: NVIDIA Docker: GPU Server Application Deployment Made Easy. On the same topic, we presented our work at DockerCon 2016 in the Open Forum track, slides are available here. In this article, I will show how easy it is to cripple or even crash a competing multimedia-oriented application on Android with only a few lines of code. On Android, in order to do HW decoding, an application must communicate with a process that has access to the HW codecs. However this process is easy to crash if you send it a selected MKV file. It is possible to create an Android service that checks if a competing media player is currently running and then crash the media process, thus stopping HW decoding for this player. As a result, the media player app can also crash and your phone can even reboot. I have been contributing to the open source projects VLC and VLC for Android in the last few months. I worked on the implementation of an efficient hardware acceleration module for our Android application using the MediaCodec and the OpenMAX APIs. Since your average Android application does not have sufficient permission to access /dev/* entries on your system, you must use a proxy called the mediaserver in order to communicate with HW codecs. The mediaserver works with an IPC mechanism, for instance if you want to perform HW accelerated decoding of an H264 file, you ask the mediaserver to create a decoder and you call methods on this decoder using IPC. Internally, the mediaserver is using the OpenMAX IL (OMXIL) API to manipulate HW codecs. For HW decoding, userland applications can either use IOMX (OpenMAX over IPC) or the more recent and standardized API called MediaCodec (API level 16). Using HW accelerated video decoding offers many advantages: you use less battery and you can potentially get significantly better performance. My Nexus 5 phone can only decode 4K videos with HW acceleration. Using the MediaCodec API you can even remove memory copies introduced by the IPC mechanism of mediaserver: you can directly render the frames to an Android surface. Unfortunately, there are also disadvantages: HW codecs are usually less resilient and are more likely to fail if the file is slightly ill-formed. Also, I don't know any HW codec on Android able to handle the Hi10P H264 profile. The mediaserver on Android also has its own weaknesses: since there is only one process running, if it crashes, all connected clients will suddenly receive an error with almost no chance of recovery. Unfortunately, the mediaserver source code has many calls to CHECK() which is basically assert() but not stripped from release builds. This call is sometimes used to check values that were just read from a file, see for instance the MatroskaExtractor file. When testing HW acceleration for VLC, we noticed random crashes during video playback, sometimes after 20 minutes of flawless HW decoding. The mediaserver is both easy to crash and essential for all media players applications in order to use HW decoding. Therefore, I realized it would be easy to create a small application that detects if a competing media player is started and then crashes the mediaserver to stop HW decoding. Depending on the app, and on luck too, the media player can crash or decide to fallback to SW. If the video is too large for SW decoding, playback will stutter. - Starts an Android service (code running in background even if the calling app is not in foreground). - Frequently monitors which apps are running and looks for known media players like VLC or the Android stock player. 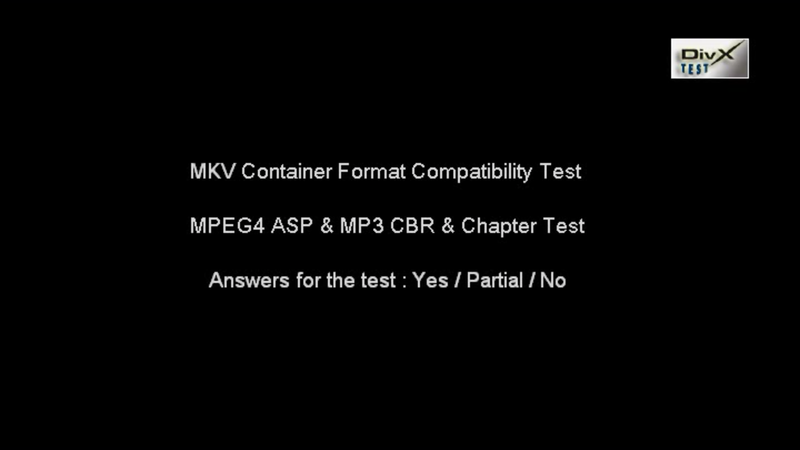 - Uses MediaScannerConnection on the CONT-4G.mkv file, the mediaserver crashes and the media player will immediately receives an error if it was using HW codecs. I've developed a small test application, and it works fine. Of course, VLC does not use this wicked technique, since it's an open source project you can check yourself in the source code of VLC and VLC for Android. - VLC: short freeze and then shows a dialog informing the user that HW acceleration failed and asking him if he wants to restart with SW decoding. - DicePlayer: freezes the player, force quit is needed. - MX Player: silent fallback to SW decoding, but the transition is visible since the video goes back in time a few seconds. - Archos Video Player: reboots your device. - Play Films: reboots your device. - Youtube: stops playback, the loading animation never stops and the video display turns black. I would like to thanks Martin Storsjö and Ludovic Fauvet for their help on Android since I started working on VLC. In this article we will present a simple code finding an optimal solution to the graph coloring problem using Integer Linear Programming (ILP). We used the GNU Linear Programming Kit (glpk) to solve the ILP problem. As a project assignment for school we recently had to implement an optimized MPI program given a undirected graph where the edges represent the communications that should take place between MPI processes. For instance this program could be used for a distributed algorithm working on a mesh where each MPI process work on a share of the whole mesh, the edges represent the exchange of boundaries conditions for each iteration. For a given process, the order of communications with all the neighbours is highly correlated with the performance of the whole program. If all processes start by sending data to the same process, the network bandwidth to this process will be a bottleneck. Therefore it is important to find a good order for communications. Ideally, at each step one process should be involved in only one communication. By coloring the edges of the graph (all adjacent edges must have different colors), we can find a good scheduling order for MPI communications. Edge coloring can be solved directly, but we have chosen to use the line graph (also called edge-to-vertex dual) instead of the original graph. Therefore we just have to color the vertices of the line graph instead of implementing an edge coloring algorithm. Initially we implemented a greedy coloring algorithm using the Welsh-Powell heuristic. This algorithm is fast and generally yields fairly good results, but I was interested in getting the optimal solution. Remembering the course I had on linear programming and the research papers I read on register allocation, I decided to use integer linear programming to solve this problem. The proposed implementation is by no means optimized, my goal was to implement a simple but optimal solution using a linear programming library. The final code is approximately 100 lines of code and I think it can be an interesting example for developers that want to start using GLPK. - A bipartite graph (2-colorable, a greedy coloring algorithm can find colors). - The smallest graph that fails the DSATUR heuristic (3-colorable, DSATUR finds 4 colors). - The Grötzsch graph (4-colorable). - Graph , i.e. 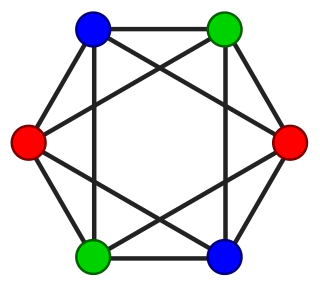 complete graph with 5 vertices (5-colorable). - The Petersen graph (3-colorable). We implemented the LP formulation given by Mehrotra and Trick (the "VC" formulation). The number of colors used by our solution is stored in an integer variable . Given an upper bound on the number of colors needed, we use binary variables: if vertex is assigned color . Now we need to define the set of constraints for the graph coloring problem. This article is not an introduction to GLPK but the library is simple to use if you have basic knowledge in linear programming, therefore I will not explain the GLPK functions used. Our function will take as input the graph as a vector of vectors, this the same representation than the input file but with the current vertex index removed from each line. To set up the constraints we must build the sparse matrix of coefficients by creating triplets . The last two columns are empty, this is because we started with an upper bound but we used only 2 colors. - If the initial bounds for is tight, solving will be faster. For the lower bound you can use 2 instead of 1 if your graph is not edgeless. To find a better upper bound you can use a greedy coloring algorithm before using ILP to find the optimal solution. - If you want to solve the problem faster, use another formulation using column generation. - If you use C++ you might want to implement your own wrapper above GLPK in order to manipulate variables and constraints easily. After reading my article, my teacher Anne-Laurence Putz kindly gave me another formulation which is simpler and generally more efficient. We assign a weight for each color, thus the solver will minimize the number of colors used when minimizing the objective function. We don't need the second constraint anymore therefore less rows are needed. I've written several articles about how to use SSE in C/C++ code, a beginners' tutorial, an explanation on saturation arithmetic with SSE and SSE applied to image processing. In this article I will introduce a new technique to help converting your scalar code to an SSE-accelerated code. Vectorization is the task of converting a scalar code to a code using SSE instructions. The benefit is that a single instruction will process several elements at the same time (SIMD: Single Instruction, Multiple Data). Sometimes the compiler manages to transform the scalar code you've written into a vectorized code using SIMD instructions, this process is called auto-vectorization. For example you can read the documentation of GCC to check the status of its tree vectorizer: http://gcc.gnu.org/projects/tree-ssa/vectorization.html, several examples of vectorizable loops are given. There are a lot of tips to help auto-vectorization: for example rewriting the code to avoid some constructs, using builtins to help the compiler, etc. But sometimes, despite all your efforts, the compiler cannot vectorize your code. If you really need a performance speedup then you will have to do vectorization by hand using the _mm_* functions. These functions are really low-level so this process can be quite hard and writing an efficient SSE code is difficult. If you are new to SSE, you might be wondering how conditional code should be vectorized. We will show in this article that this is in fact really easy. You only need to know boolean algebra. This example is simple: we have a (long) array of floats and we want to compute the square root of each value from these array. Given that a negative number has an imaginary square root, we will only compute the square root of positive values from the array. Before using SSE instructions, let's see if GCC manages to vectorize our code, we compile the code using the following flags: -O3 -msse3 -ffast-math. sse.cc:12: note: not vectorized: control flow in loop. sse.cc:12: note: bad loop form. sse.cc:8: note: vectorized 0 loops in function. Auto-vectorization failed because of the if statement, we will have to vectorize the code by hand. sse.cc:12: note: Profitability threshold is 4 loop iterations. sse.cc:8: note: vectorized 1 loops in function. // FIXME: compute square root. SSE offers a whole range of comparison instructions. These instructions perform 4 comparisons at the same time and the result is stored in another register. If the comparison is true for one pair of values from the operands, all corresponding bits of the result will be set, otherwise the bits are cleared. (Note: as we are comparing with zero, we could have just used the sign bit here). Now we just need to combine the two registers using a binary OR and that's it! If you want coherent benchmark results, don't forget to clean your cache between two iterations! Thanks to the comparison instructions available with SSE, we can vectorize a scalar code that used a if statement. Our scalar code was very simple, but if it was at the end of a complicated computation, it would be tempting to perform the square root without SSE on the result vector. We have shown here that this computation can also be done using SSE, thus maximizing parallelism. A few days ago I had a discussion with a colleague on how to debug a stripped binary on linux with GDB. Yesterday I also read an article from an ex-colleague at EPITA on debugging with the dmesg command. I therefore decided to write my own article, here I will demonstrate how to use GDB with a stripped binary. You can notice we have used a GCC attribute to prevent the compiler from inlining the function. When compiling a program, GCC (for example) adds symbols to the binary to help the developer during debugging. There are several types of symbols but the goal of this article is not to explain them. Reading symbols from /home/felix/test/a.out...(no debugging symbols found)...done. Why stripping you may ask ? Well, the resulting binary is smaller which mean it uses less memory and therefore it probably executes faster. When applying this strategy system-wide, the responsiveness of the system will probably be better. You can check this by yourself: use nm on /bin/*: you won't find any symbols. Okay, there are no more symbols now, what does it change when using GDB ? We cannot add a breakpoint now, even on the main function. As GDB does not know the bounds of the functions, it does not know which address range should be disassembled. Once again, we will need to use a command working at a lower level. By looking at the code, you might be asking yourself: "Where the hell are we??" The C runtime has to do some initialization before calling our own main function, this is handled by the initialization routine __libc_start_main (check its prototype here). Before calling this routine, arguments are pushed on the stack in reverse order (following the cdecl calling convention). The first argument of __libc_start_main is a pointer to our main function, so we now have the memory address corresponding to our code: 0x8048440. This is what we found with nm earlier! This looks like our main function, the value 21 (0x15) is placed on the stack and a function (the address corresponds to fun) is called. Afterwards, the eax register is cleared because our main function returns 0. To step to the next assembly instruction you can use the stepi command. Recently I have written articles on image processing and on SSE, so here is an article on image processing AND SSE! SSE instructions are particularly adapted for image processing algorithms. For instance, using saturated arithmetic instructions, we can conveniently and efficiently add two grayscale images without worrying about overflow. We can easily implement saturated addition, subtraction and blending (weighted addition) using SSE operators. We can also use floating point SSE operations to speed-up algorithms like Hough Transform accumulation or image rotation. In this article we will demonstrate how to implement a fast dilation algorithm using only a few SSE instructions. First we will present the dilation operator, afterwards we will present its implementation using SSE, and finally we will discuss about the performance of our implementation. Dilation is one of the two elementary operators of mathematical morphology. This operation expands the shape of the objects by assigning to each pixel the maximum value of all pixels from a structuring element. A structuring element is simply defined as a configuration of pixels (i.e. a shape) on which an origin is defined, called the center. The structuring element can be of any shape but generally we use a simple shape such as a square, a circle, a diamond, etc. On a discrete grayscale image, the dilation of an image is computed by visiting all pixels; we assign to each pixel the maximum grayscale value from pixels in the structuring element. Dilation, along with its dual operation, erosion, forms the basis of mathematical morphology algorithms such as thinning, skeletonization, hit-or-miss, etc. A fast implementation of dilation and erosion would therefore benefit to all these operators. 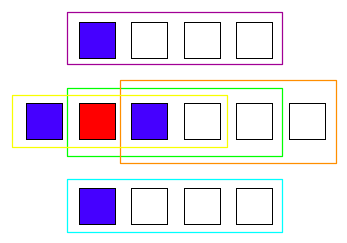 The red pixel is the center, and the blue pixels forms the structuring element. In order to avoid losing time when dealing with borders, each image has extra pixels to the left and to the right of each row. The number of additional rows depends on the width of the structuring element. There is also a full additional row before and after the image data. Thus, a dilation can be computed without having to handle borders in the main loop. // Image is just a structure containing the size of the image and a pointer to the data. // Step is the size (in bytes) of one row (border included). Using the SSE function _mm_max_epu8 it is possible to compute the maximum on 16 pairs of values of type unsigned char in one instruction. 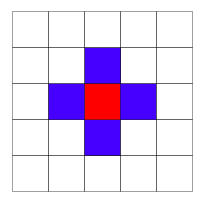 The principle remains the same, but instead of fetching a single value for each offset value, we fetch 16 adjacent pixels. We can then compute the dilation equivalent to 16 structuring elements using SSE instructions. We need to perform 5 SSE loads for our structuring element, as illustrated in the following image (but with 4 pixels instead of 16). Each rectangle corresponds to a SSE load. By computing the minimum of each groups of pixel and storing the result in the destination image we have perform the dilation with 4 consecutive structuring elements. Regarding the implementation, it is really verbose (as always with SSE! ), but still short, we only need to change the inner loop. // 3 aligned loads: more efficient. // Store the result in the destination image. We have used an aligned SSE load for the center and the pixels above and below the center. As mentioned in previous articles, using aligned load improves performances. We have measured the performances of the SSE implementation against the scalar implementation on a Intel Core2 Duo P7350 (2 GHz). Two grayscale images of Lena were used. Using SSE, we managed to obtain a speedup factor of 6 compared to the scalar implementation! Our algorithm runs pretty fast but it could be even faster! If we perform the dilation in-place, the code runs twice as fast as the previous implementation. If it's still not fast enough for your needs, you can also implement the algorithm directly in assembly using advanced techniques such as instruction pairing, prefetching... A good step-by-step tutorial on the subject can be found here for 4x4 matrix-vector multiplication.